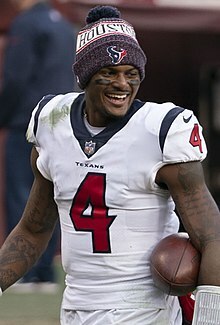 Derrick Deshaun Watson (born September 14, 1995) is an American football quarterback for the Houston Texans of the National Football League (NFL). He played college football at Clemson and led the team to a CFP championship game appearance in 2015 and a national championship win in 2016. He was selected by the Texans 12th overall in the 2017 NFL Draft. In 2018, his second year, Watson was named to his first career Pro Bowl. Watson was born in Gainesville, Georgia on September 14, 1995, to Deann Watson and Don Richardson. He attended Gainesville High School, arriving there in the fall of 2010. He played for the Red Elephants football team. Gainesville head coach Bruce Miller had planned to start a rising junior to quarterback his spread offense, but Watson won the starting spot. He was the first freshman quarterback Coach Miller had ever started. During his career, Watson set numerous state records, including total yards (17,134), total touchdowns (218), career passing yards (13,077), and career passing touchdowns (155). He rushed for 4,057 yards and 63 touchdowns. Watson excelled in his junior year, winning a state championship and earning accolades such as Junior All-American, 2014 Player to Watch, and 2014 Top 100 Recruit. During his sophomore and senior years, he led the Gainesville High School Football Team to the state semi-finals. Watson received offers from numerous colleges before verbally committing to Clemson University on February 1, 2012, to play college football. He was ranked the number one quarterback recruit for the 2014 class by ESPN 300. Watson enrolled at Clemson in January 2014. During his high school career, Watson had worn #4. At Clemson, that number had been retired after quarterback Steve Fuller graduated. However, Fuller allowed the number to come out of retirement so that Watson could wear it. He entered his true freshman season as the backup to starter Cole Stoudt, but still received extensive playing time. Through three games, he completed 29-of-41 passes for 479 yards with four touchdowns and no interceptions, outperforming Stoudt. Watson was named the Tigers' starter on September 21. In Watson's first career start against the North Carolina Tar Heels, he set a school record with six touchdown passes and threw for 435 yards en route to a 50–35 victory. On October 11, 2014, Watson broke a bone in his right hand in a game against the Louisville Cardinals. He left in the first quarter and was out for the game. As a result of the injury, he missed the games against Boston College, Syracuse, and Wake Forest. He returned for the game against Georgia Tech only to suffer an LCL strain, missing most of the game. During the following week in practice it was reported that Watson had tweaked his knee. He did not play against Georgia State the following week, but came back the following week to play against state rival South Carolina. After defeating the Gamecocks, it was revealed to the public that Watson had played the game with a torn ACL. He underwent surgery on his left knee to repair his ACL the Friday before Clemson's bowl game against Oklahoma. In 2015, Watson led Clemson to an undefeated 12–0 regular season and a #1 ranking in the polls. After the regular season, the Tigers qualified for the ACC Championship Game, facing off against #10 North Carolina. Watson threw for 289 yards and three touchdowns, and ran for 131 yards and two touchdowns in the game, to lead the Tigers to a 45–37 win over the Tar Heels, winning the ACC Championship for the first time since 2011. Watson was also named the ACC Championship Game MVP for his performance. The Tigers were selected to participate in the 2016 College Football Playoff and were selected as the #1 seed. They faced off against the #4 seed Oklahoma Sooners in the Orange Bowl, one of the two College Football Playoff Semifinal games. Watson threw for 189 yards and a touchdown, and ran for 145 yards and a touchdown, as he led Clemson to a 37–17 victory over the Sooners. Watson was named the 2015 Orange Bowl Offensive MVP for his performance. With the win, the Tigers advanced to the 2016 College Football Playoff National Championship game against #2 Alabama Crimson Tide, where Clemson lost 45–40. Watson threw for 405 yards and four touchdowns in the game, and ran for another 73 yards on the ground in the losing effort. He surpassed the 4,000 yard passing mark for the season in this game. He set the record for most total yards in national championship game history, with 478 yards (405 passing / 73 rushing) against the nation's best defense. In addition to throwing for over 4,000 yards, he also rushed for over 1,000 yards to complete his true sophomore season. Watson was the first player ever to accomplish this feat in the history of college football. For his accomplishments during the 2015 season, Watson was named a finalist for the Heisman Trophy, the first time a Clemson player has been invited to the Heisman Trophy presentation. He finished third in the balloting after winner Derrick Henry, running back from Alabama, and Christian McCaffrey, running back from Stanford. Watson's third-place finish in Heisman voting is the best finish in Clemson football history. He won the Davey O'Brien Award, which is awarded annually to the best college quarterback. He was also named the 2015 ACC Player of the Year and ACC Offensive Player of the Year. Watson started his junior season off positively with 248 passing yards, one touchdown, and one interception in a narrow 19–13 victory over the Auburn Tigers. On October 1, against Louisville, Watson finished with 306 passing yards, five touchdowns, and three interceptions in the 42–36 victory. Watson finished with 378 passing yards and two touchdowns against Florida State on October 29, 2016, rallying to a 37–34 win. Against Syracuse on November 5, 2016, he had 169 passing yards with two touchdowns, but left the game with an apparent shoulder injury. On November 26, against South Carolina, he passed for 347 yards, six touchdowns, and one interception in the 56–7 victory. In the fall of 2016, Watson became the first player since Jason White in 2003–2004 to win the Davey O'Brien Award in back-to-back years. That year he was also selected as the winner of the Johnny Unitas Golden Arm Award and was the first repeat winner of the Manning Award. For the second year in row, Watson was named one of five Heisman Trophy candidates, along with Michigan's Jabrill Peppers, Oklahoma's Baker Mayfield and Dede Westbrook, and Louisville's Lamar Jackson. He again came up short of winning, as Louisville's Lamar Jackson was awarded the Heisman Trophy for his efforts and performances throughout the 2016 season, finishing with nearly twice as many first place votes as Watson. After defeating Ohio State 31–0 in the CFP semifinal in the Fiesta Bowl and receiving the offensive MVP award for his efforts, Clemson defeated No. 1 Alabama by a score of 35–31 in the 2017 College Football Playoff National Championship. Watson completed 36-of-56 passes for 420 yards and three touchdowns against the nation's top-ranked defense, including the last-second game-winning pass to wide receiver, Hunter Renfrow. He also rushed for 43 yards and a touchdown. This gave the Clemson Tigers program its second national championship in school history, ending a three-decade national championship drought. Watson was awarded the offensive MVP award for his performance during the national championship game. On November 8, 2016, Watson, along with three other Clemson players, Wayne Gallman, Artavis Scott, and Mike Williams, declared for the NFL Draft. In December 2016, Watson graduated with a degree in Communication after three years at Clemson. Coming out of Clemson, Watson was projected to be a first round pick by the majority of scouts and analysts. He was ranked as the top quarterback available in the draft by Sports Illustrated, Pro Football Focus, and ESPN. He was ranked the second best quarterback by NFLDraftScout.com. The Houston Texans drafted Watson in the first round (12th overall) of the 2017 NFL Draft. The Texans acquired the pick from the Cleveland Browns, trading their 25th overall pick in the 2017 NFL Draft and their first round pick in the 2018 NFL Draft. Houston had already traded (then, Houston starting quarterback) Brock Osweiler to Cleveland for draft picks earlier that year in part of what was widely considered the first major "salary dump" of the NFL. Watson was the third quarterback taken in the draft, behind Mitchell Trubisky, who went second overall to the Chicago Bears, and Patrick Mahomes, who went tenth overall to the Kansas City Chiefs. On May 12, 2017, the Texans signed Watson to a four-year, $13.84 million contract featuring a $8.21 million signing bonus. Watson made his first regular-season appearance on September 10, 2017, against the Jacksonville Jaguars. He entered the game after Tom Savage was benched at halftime. He played for the remainder of the game. In the third quarter, he threw his first NFL touchdown, a 4-yard pass to wide receiver DeAndre Hopkins. He finished with 102 passing yards, a touchdown, and an interception, as the Texans lost by a score of 29–7. Watson made his first career start on September 14, 2017, which was his 22nd birthday, during Thursday Night Football on the road against the Cincinnati Bengals. He finished with 125 passing yards, 67 rushing yards, and a 49-yard rushing touchdown as the Texans won 13–9. During Week 3 against the defending Super Bowl champion, the New England Patriots, Watson finished with 301 passing yards, two touchdowns, and two interceptions while also rushing for 41 yards as the Texans lost 36–33. During Week 4 against the Tennessee Titans, he completed 25-of-34 passes for 283 yards, 4 touchdowns, and an interception while also rushing for 24 yards and a touchdown as the Texans won 57–14. His 5 total scores tied the NFL rookie touchdown record. He is also the first rookie to pass for at least four touchdowns and rush for one touchdown in a game since Hall of Famer Fran Tarkenton did so for the Minnesota Vikings in 1961. His performance in Week 4 earned him AFC Offensive Player of the Week. Watson followed up his Week 4 performance with another great outing, this time on Sunday Night Football against the Kansas City Chiefs. In the 42–34 loss, Watson finished 16-of-31 for 261 yards and 5 touchdown passes, tying an NFL rookie record for touchdown passes thrown in a single game. He also rushed for 31 yards and a 2-point conversion. During Week 6, Watson threw for 225 yards, 3 touchdowns, and an interception while also rushing for 23 yards as the Texans beat the Cleveland Browns by a score of 33–17. After a bye week, the Texans went on the road to face off the Seattle Seahawks. During that game, Watson posted his first career game with over 400 passing yards. He finished with 402 passing yards, 4 touchdowns, 3 interceptions, and 67 rushing yards as the Texans lost 41–38. Watson threw 16 touchdowns in the month of October, setting the NFL record for most touchdown passes by a rookie in a calendar month. He was named the AFC Offensive Player of the Month and the NFL Offensive Rookie of the Month for October. On November 2, Watson tore his ACL on a non-contact play during practice, prematurely ending his rookie season. In 7 games (6 starts) of his rookie year, Watson finished with 1,699 passing yards, 19 touchdowns, and 8 interceptions. He also rushed for 269 yards and 2 touchdowns. On November 8, Watson underwent successful surgery on his right knee to repair his ACL, and no further knee damage was reported. Watson was ranked 50th by his peers on the NFL Top 100 Players of 2018. On September 9, 2018, against the New England Patriots in the season opener, Watson returned from injury and threw for 176 yards with a touchdown and an interception and rushed eight times for 40 yards as the Texans lost by a score of 20–27. During Week 2 against the Tennessee Titans, Watson passed for 310 yards, two touchdowns, and one interception while also rushing for 44 yards as the Texans lost by a score of 17–20. In Week 3, against the New York Giants, Watson passed for 385 passing yards, two touchdowns, and one interception in the 27–22 loss. He also rushed for 36 yards. During Week 4 against the Indianapolis Colts, he had 375 passing yards, two passing touchdowns, and one interception to go along with 41 rushing yards and a rushing touchdown to give the Texans their first victory of the 2018 season. During Week 5 against the Dallas Cowboys, Watson passed for 375 yards, one touchdown, and one interception as the Texans won 19–16 in overtime. In Week 6 against the Buffalo Bills, Watson passed for 177 yards, one touchdown, and two interceptions as the Texans won 20–13. During Week 7, the Texans went on the road to face the Jacksonville Jaguars in Week 7 and won by a score of 20–7 with Watson passing for 139 yards and a touchdown. During a Week 8 42–23 victory over the Miami Dolphins, Watson completed 16-of-20 passes for five touchdowns, tying his career high for most touchdown passes in a game and did not throw an interception for the second week in a row. During Week 9 against the Denver Broncos, Watson had another great outing, finishing 17-of-24 for 213 yards and two touchdowns as the Texans narrowly won 19–17. After a bye week, the Texans went on the road to face the Washington Redskins. Watson passed for 208 yards, one touchdown, and two interceptions as the Texans narrowly won 23–21 to extend their winning streak to seven games. Watson bounced back in Week 12, throwing for 210 yards and two touchdowns while also rushing for 70 yards and a touchdown as the Texans beat the Titans by a score of 34–17. Watson continued his hot streak against the Cleveland Browns during Week 13. In that game, Watson passed for 224 yards and a touchdown as the Texans won by a score of 29–13. The next week, the Texans were dealt with their fourth loss on the season, by a score of 24–21, from division rival Indianapolis Colts, with Watson passing for 267 yards and a touchdown in the contest. In Week 15, the Texans beat the New York Jets on the road by a score of 29–22, with Watson providing 294 passing yards and two touchdowns. In the final road game of the season against the Philadelphia Eagles, the Texans narrowly lost 32–30. Watson passed for 339 yards and two touchdowns while also rushing for 49 yards and two touchdowns. In the Week 17 regular-season finale, the Texans returned home and defeated the Jaguars by a score of 20–3 with Watson passing for 234 yards. In addition, he rushed for 66 yards and a touchdown in the AFC South-clinching victory. Watson finished the regular season with a career-high 4,165 passing yards, 26 touchdowns, nine interceptions, 551 rushing yards, and five rushing touchdowns. Making his first postseason appearance in his career, Watson and the Texans hosted division-rival Indianapolis Colts in the Wild Card Round. In that game, Watson completed 29-of-49 passes for 235 yards as the Texans lost by a score of 21–7. On January 21, 2019, Watson was named to his first Pro Bowl, replacing the Super Bowl bound Tom Brady. Watson is Christian and converted to the Southern Baptist Convention after coming to Houston. In 2006, when Watson was 11 years old, Atlanta Falcons running back Warrick Dunn donated a home to his family. It was donated through Dunn's charity Homes for the Holidays, who partnered with Habitat for Humanity. In 2019, Watson surprised his mom with a renovation to that home in an episode of the Houzz series "My Houzz." In 2017, Watson donated his first NFL game check to three cafeteria employees affected by Hurricane Harvey who work at the Houston Texans' NRG Stadium. The total amount donated was around $27,000. ^ Raynor, Grace. "Soon to be an NFL millionaire, Deshaun Watson will never forget the small Georgia town that raised him". Post and Courier. Retrieved January 21, 2018. ^ "No. 1 high school recruit headed to Clemson". FOX Carolina. November 4, 2013. ^ Miller, Andrew. "Clemson's quarterback of the future: DeShaun Watson". Post and Courier. ^ a b "Deshaun Watson". ESPN.com. ^ "Gainesville (GA) Football – MaxPreps". MaxPreps.com. December 17, 2015. ^ "Deshaun Watson Recruit Interests". 247sports.com. Retrieved February 20, 2019. ^ "Deshaun Watson Bio". ClemsonTigers.com. ^ Hale, David. "Clemson Tigers Deshaun Watson proves a quick study – ACC Blog- ESPN". ESPN.com. ^ "Deshaun Watson to make first start for Clemson. – College Football Insider Blog". The Atlanta Journal-Constitution. ^ Brenner, Aaron. "It's his time: Deshaun Watson to make his first career start Saturday vs. UNC". Post and Courier. ^ Bonnell, Rick. "Clemson freshman QB Deshaun Watson throws six TDs in win over UNC". Charlotte Observer. ^ "Louisville at Clemson Box Score, October 11, 2014". College Football at Sports-Reference.com. Retrieved January 21, 2018. ^ "Report: Clemson QB Deshaun Watson (hand) likely out five weeks". SI.com. Retrieved January 21, 2018. ^ Hale, David. "Clemson Tigers QB Deshaun Watson avoids ACL injury, could play versus South Carolina". ESPN.com. ^ "South Carolina at Clemson Box Score, November 29, 2014". College Football at Sports-Reference.com. Retrieved January 21, 2018. ^ Taylor, John. "Swinney: Deshaun Watson played on torn ACL". CollegeFootballTalk. ^ Solomon, Jon. "Poverty, major injury couldn't stop Clemson's Deshaun Watson". CBSSports.com. Retrieved October 2, 2017. ^ "2015 Polls". College Football at Sports-Reference.com. Retrieved February 20, 2019. ^ "North Carolina vs Clemson Box Score, December 5, 2015". College Football at Sports-Reference.com. Retrieved January 21, 2018. ^ "Deshaun Watson's Legacy". Clemson Tigers Official Athletics Site. February 2, 2017. Retrieved February 20, 2019. ^ "Orange Bowl – Oklahoma vs Clemson Box Score, December 31, 2015". College Football at Sports-Reference.com. Retrieved January 21, 2018. ^ "College Football Championship – Alabama vs Clemson Box Score, January 11, 2016". College Football at Sports-Reference.com. Retrieved January 21, 2018. ^ "Deshaun Watson 2015 Game Log". College Football at Sports-Reference.com. Retrieved January 21, 2018. ^ "Clemson QB Watson becomes first 4,000/1,000 player in FBS history". FOX Sports. Retrieved December 10, 2018. ^ "2015 Heisman Trophy Voting". College Football at Sports-Reference.com. Retrieved January 21, 2018. ^ "Clemson QB Deshaun Watson wins Davey O'Brien Award". star-telegram. Retrieved December 10, 2018. ^ "Clemson QB Deshaun Watson voted ACC player of year by ACSMA". USA TODAY. Retrieved December 10, 2018. ^ "Clemson QB Deshaun Watson voted ACC offensive player of year". USA TODAY. Retrieved December 10, 2018. ^ "Clemson at Auburn Box Score, September 3, 2016". College Football at Sports-Reference.com. Retrieved January 21, 2018. ^ "Louisville at Clemson Box Score, October 1, 2016". College Football at Sports-Reference.com. Retrieved January 21, 2018. ^ "Clemson, Watson rally over Florida St". SF Gate. Retrieved October 29, 2016. ^ Goodbread, Chase. "Clemson's Deshaun Watson suffers shoulder injury vs. Syracuse". NFL. Retrieved November 5, 2016. ^ "Syracuse at Clemson Box Score, November 5, 2016". College Football at Sports-Reference.com. Retrieved January 21, 2018. ^ "South Carolina at Clemson Box Score, November 26, 2016". College Football at Sports-Reference.com. Retrieved January 21, 2018. ^ Mackel, Fletcher (January 12, 2017). "Clemson's Deshaun Watson becomes first repeat winner of Manning Award". WDSU. ^ "Lamar Jackson won a two-horse Heisman race with Deshaun Watson". SB Nation. ^ "2016 Heisman Trophy Voting". College Football at Sports-Reference.com. Retrieved January 21, 2018. ^ "Fiesta Bowl – Ohio State vs Clemson Box Score, December 31, 2016". College Football at Sports-Reference.com. Retrieved January 21, 2018. ^ "College Football Championship – Clemson vs Alabama Box Score, January 9, 2017". College Football at Sports-Reference.com. Retrieved January 21, 2018. ^ "Clemson vs. Alabama – Box Score – January 9, 2017 – ESPN". ESPN.com. ^ "Deshaun Watson among four Clemson juniors to declare for NFL draft". USA Today. ^ Goodbread, Chase. "Deshaun Watson leads 22 prospects attending 2017 NFL Draft". NFL. Retrieved April 13, 2017. ^ Thamel, Pete (October 28, 2016). "How Deshaun Watson is starting new trend in race to the NFL". Campus Rush. Retrieved November 2, 2016. ^ "Deshaun Watson". sports-reference.com. Sports Reference LLC. Retrieved July 24, 2017. ^ Chris Burke (April 24, 2017). "2017 NFL draft rankings: Top prospects by position". si.com. Retrieved May 13, 2017. ^ "Top 32 Prospects for the 2017 NFL Draft". profootballfocus.com. Retrieved May 13, 2017. ^ Jeff Legwood (April 22, 2017). "Ranking the 2017 NFL draft's Top 100 Players". ESPN.com. Retrieved May 13, 2017. ^ "Deshaun Watson". nfldraftscout.com. Retrieved July 24, 2017. ^ McGinn, Bob (April 22, 2017). "Ranking the NFL draft prospects: Quarterbacks". PackersNews.com. Archived from the original on June 16, 2018. Retrieved June 16, 2018. ^ "Combine Player Profiles – Deshaun Watson". National Football League. Retrieved April 27, 2017. ^ "2017 NFL Draft Listing". Pro-Football-Reference.com. Retrieved January 21, 2018. ^ Wesseling, Chris (April 27, 2017). "Trade! Texans move up, grab Deshaun Watson". NFL.com. ^ Kirshner, Alex. "Ultimate college winner Deshaun Watson is set up to win immediately at Houston". SB Nation. Retrieved April 28, 2017. ^ Bowen, Matt. "Why Deshaun Watson already has the respect of NFL veterans". ESPN. Retrieved April 28, 2017. ^ Goodbread, Chase. "Deshaun Watson hopes for Jordan-like status with NFL career". NFL. Retrieved April 28, 2017. ^ Patra, Kevin. "Deshaun Watson signs rookie contract with Houston Texans". NFL.com. Retrieved May 12, 2017. ^ "Jacksonville Jaguars at Houston Texans – September 10th, 2017". Pro-Football-Reference.com. Retrieved September 14, 2017. ^ Shook, Nick. "Deshaun Watson replaces Tom Savage in loss to Jags". NFL. Retrieved September 10, 2017. ^ Barshop, Sarah. "Deshaun Watson dazzles with record run, instills hope in Texans' first win". ESPN. Retrieved September 15, 2017. ^ "Houston Texans at New England Patriots – September 24th, 2017". Pro-Football-Reference.com. Retrieved September 25, 2017. ^ Stites, Adam (October 1, 2017). "Deshaun Watson ties rookie QB record with 5 total touchdowns". SB Nation. Retrieved October 2, 2017. ^ "Deshaun Watson shows what's possible for Texans with record performance – SportsFan 100.5 Central Wisconsin's Home for ESPN Radio, Wausau, Stevens Point, Wisconsin Rapids, Marshfield". Retrieved October 2, 2017. ^ "Deshaun Watson, Todd Gurley among Players of Week". NFL.com. October 4, 2017. ^ "Kansas City Chiefs at Houston Texans – October 8th, 2017". Pro-Football-Reference.com. Retrieved October 9, 2017. ^ "Cleveland Browns at Houston Texans – October 15th, 2017". Pro-Football-Reference.com. Retrieved October 16, 2017. ^ Knoblauch, Austin (November 2, 2017). "Texans QB Deshaun Watson tears ACL in practice". nfl.com. Retrieved November 2, 2017. ^ "Deshaun Watson 2017 Game Log". Pro-Football-Reference.com. Retrieved November 3, 2017. ^ Lewis, Edward. "Deshaun Watson: I'll return better 'than ever before'". NFL. Retrieved November 3, 2017. ^ "Deshaun Watson undergoes surgery on torn ACL". ESPN. Retrieved November 8, 2017. ^ "'Top 100 Players of 2018': Houston Texans rookie quarterback Deshaun Watson". Retrieved October 29, 2018. ^ Barshop, Sarah. "Texans QB Watson: 'You can put the L on me'". ESPN.com. Retrieved October 6, 2018. ^ "Time runs out on Watson, Texans without FG try". ESPN.com. September 16, 2018. Retrieved January 22, 2019. ^ "Giants vs. Texans RECAP, score and stats (9/23/18)". NJ.com. Retrieved October 6, 2018. ^ Wood, Anthony (September 30, 2018). "Deshaun Watson returns to form in Texans' 37–34 win over Colts". USA Today. Retrieved October 6, 2018. ^ "Watson helps Texans to 19–16 win over Cowboys in overtime". USA TODAY. Retrieved January 22, 2019. ^ "Watson plays through injury, Texans beat reeling Jags 20–7". USA TODAY. Retrieved January 22, 2019. ^ Bishop, Sarah (October 25, 2018). "Deshaun Watson ties career high with 5 TDs as Texans get 'swagger back'". ESPN. KTRK-TV. Retrieved October 26, 2018. ^ "Texans' Deshaun Watson: Efficient in win over Broncos". CBSSports.com. Retrieved January 22, 2019. ^ "Texans beat Redskins 23–21 to extend winning streak to 7". USA TODAY. Retrieved January 22, 2019. ^ "Deshaun Watson dazzles in Texans MNF blowout of Titans". www.houstontexans.com. Retrieved January 22, 2019. ^ "Deshaun Watson beats pressure from Browns". www.houstonchronicle.com. December 2, 2018. Retrieved January 22, 2019. ^ "Colts snap Texans' 9-game winning streak with 24–21 win". 13 WTHR Indianapolis. December 9, 2018. Retrieved January 22, 2019. ^ "Watson leads Texans to 29–22 comeback win over Darnold, Jets". USA TODAY. Retrieved January 22, 2019. ^ Rieken, Kristie (December 31, 2018). "Texans clinch AFC South title with 20–3 win over Jaguars". AP NEWS. Retrieved January 22, 2019. ^ "Deshaun Watson brings hope to Texans". www.houstonchronicle.com. January 4, 2019. Retrieved January 22, 2019. ^ "Texans struggle to protect Watson in 21–7 loss to Colts". USA TODAY. Retrieved January 22, 2019. ^ "Deshaun Watson to replace Tom Brady in Pro Bowl". ABC13 Houston. January 21, 2019. Retrieved January 22, 2019. ^ "Deshaun Watson". pro-football-reference.com. Sports Reference LLC. Retrieved December 1, 2016. ^ a b "THE WEEK THAT WAS – WEEK 5". nflcommunications.com. Retrieved May 17, 2018. ^ "11 titanic things about Marcus Mariota's magical NFL debut". Retrieved December 25, 2017. ^ a b Alper. Josh (October 29, 2017). "Deshaun Watson sets record with 19 passing TDs in first seven games". profootballtalk.nbcsports.com. Retrieved May 17, 2018. ^ Schwab, Frank (November 2, 2017). "Which team screwed up most passing on Deshaun Watson? (It's not the Browns)". sports.yahoo.com. Retrieved May 20, 2018. ^ Haislop, Tadd (October 30, 2017). "Deshaun Watson-vs.-Russell Wilson duel in Seattle was historic". sportingnews.com. Retrieved May 20, 2018. ^ "Houston Texans Single-Season Passing Leaders". pro-football-reference.com. Sports Reference LLC. Retrieved May 17, 2018. ^ "Faith led Watson to Clemson". ^ "Deshaun Watson leads Texans to first win, wows fans and players with touchdown run". ^ Matthew Chambers (January 10, 2017). "Former Falcon's RB Warrick Dunn donated house to DeShaun Watson's family in 2006". TheFalcoholic.com. Retrieved January 12, 2017. ^ Roberts, Madison. "Watch Texans QB Deshaun Watson Surprise His Mom with a Makeover of His Childhood Home". People.com. ^ "Deshaun Watson donated his first NFL game check to cafeteria workers affected by Hurricane Harvey". SBNation.com. Retrieved September 29, 2017. ^ "Deshaun Watson donates game check to Harvey victims at stadium". Retrieved September 29, 2017. This page was last edited on 19 April 2019, at 00:43 (UTC).